Are you reading this, Orlando? 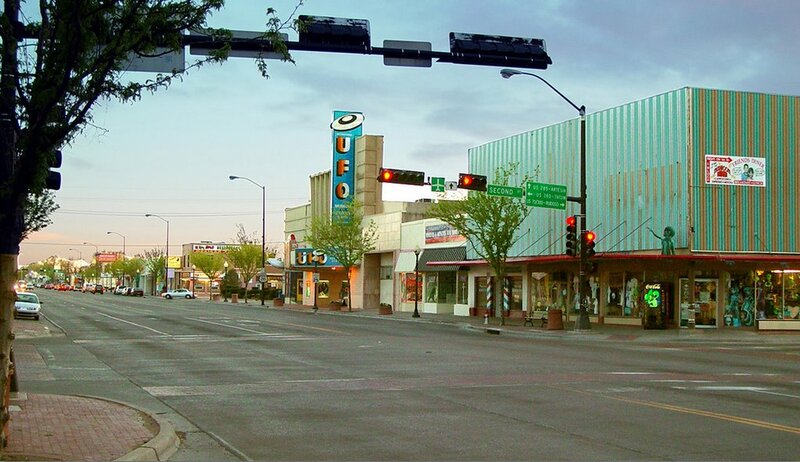 Roswell, New Mexico, already boasts the world’s only UFO museum plus downtown streetlamps shaped like aliens. Now, the city is ready to take its tourism to the next level and is in early talks about an extraterrestrial-themed amusement park, reports United Press International. "This is not a guaranteed project but it has gone farther than any other theme park that has been considered for the city of Roswell, and it's looking very positive," said Roswell City Planning Director Zachary Montgomery late last week. I am new to Blogging. However I did live in Roswell for several years and worked in the so called "Alien Hangar" for three of them. It is important to note that Roswell has one of the longest runways in the world. Which makes it a very attractive landing site for rentry from space,and a well established aircraft maintenance business. Great blog Tricia. This alien theme park could be a perfect tie in with the Spaceport and bring much needed tourism to the city of Roswell and the State as a whole. As the marketing writer for the New Mexico Economic Development Department, Tricia Ware looks for creative ways to share EDD's programs with the public. This blog is a way for space enthusiasts to tap into national and international news about Spaceport America and New Mexico's commercial space industry, be the first to see announcements, and connect with others who have similar interests. The views expressed here are not necessarily those of the New Mexico Economic Development Department, any agency of the State of New Mexico, the New Mexico Economic Development Department family of websites, or any other websites linked herein. All rights reserved. Not for reproduction without permission of the New Mexico Economic Development Department. © New Mexico Economic Development Department.